Bring all new flavors to your specialty drink menu with this Torani sugar free strawberry flavoring syrup! It's sweetened with Splenda brand sweetener, which offers the taste of real sugar without the calories. This tempting flavor will complement your beverages without overpowering them or being too sweet, while the user-friendly bottle will be convenient for your busy baristas to use. Torani flavoring syrups are specially formulated to resist curdling in milk and to hold up well under heat, making them the perfect choice for espresso-based drinks, brewed coffee or tea, and more. Use this flavor for frappes, iced coffees, smoothies, and even baking! Add the sweet, familiar taste of summer strawberries to smoothies, sodas, and desserts with this sugar free strawberry flavoring syrup. This refreshing and fruity syrup tastes great drizzled over cheesecakes and tortes, or poured over shaved ice for a delicious sugar free summer treat. Discover new Torani recipes for this flavoring syrup, including light strawberry lemonade, sugar free coconut strawberry soda, sugar free strawberry iced tea, and more! Pour ingredients over ice and blend. Garnish with whipped cream, if desired. Combine chilled tea and Torani Signature Syrups in a tall glass filled with ice and stir well. The Torani Sugar Free Stawberry Flavoring syrup is a great product to offer your diabetic customers. This product has a great flavor that is not lacking in taste. Order this for the first time the other day. It is perfect if you want to add a little strawberry flavor to your oatmeal without the sugar. The syrup is all so perfect to but in water for flavor or even for a cocktail on a nice summer night. The sugar free strawberry Torani syrup is a delicious addition to a variety of drinks. While the fruity flavor isn't meant for coffee, it is suited very well for milk, milkshakes, yogurt, iced tea, lemonade, and many desserts. It has a great strawberry flavor my family loves. We've been using this for our sugar free strawberry coffee and smoothie drinks! They are a huge hit in our store. Lots of diabetics love it!! This Torani strawberry syrup is sweetened with Splenda. Some people don't like Splenda but I think its fine. The strawberry flavor is great and technically it is sugar free. This flavor is essential behind our bar, it is easily our top seller with our customers and adding it with frozen strawberries really brings out the flavor. Torani Strawberry syrup is a must for all coffee lovers (and tea enthusiasts). In my household, we run out of strawberry syrup before any of the other flavors. Whether you try it in coffee, tea, or even water, the taste never disappoints! I like this flavor for ice cream, funnel cakes, pancakes, etc. It tastes just like the juice if you mix strawberry and sugar. My husband likes it on his ice cream too! Torani has a huge line of flavors and their ‘Sugar Free’ line does not disappoint. This strawberry syrup is packed full a flavor with a true strawberry taste. Summer camp is the place for fun ice cones an the kids just love strawberries favored ice cones an the adults enjoyed the flavor in creamy coffee ! The Strawberry syrup has an aftertaste but come on...It is sugar free..They can not all be perfect. This sugar free strawberry versions allows me to get close to strawberry flavor in drinks so no complaints! Really light on flavor. Light crisp color makes it appealing to the little ones, the sugar free options makes it appealing to the healthy moms and dads. Not my favorite but for sure a keeper for the shop. 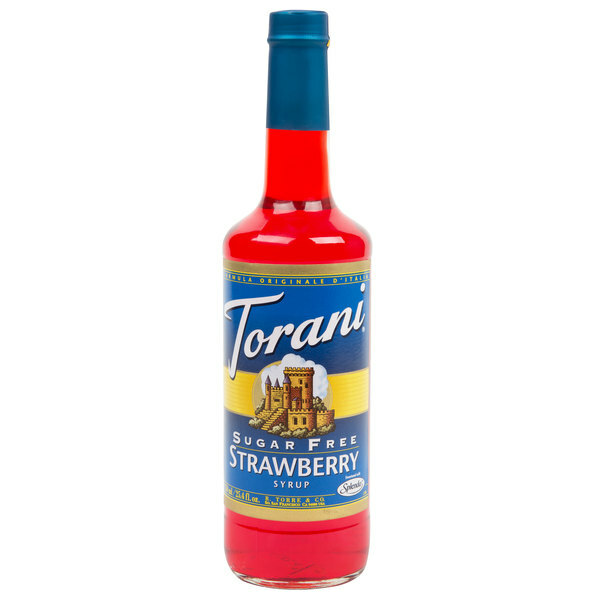 Strawberry is one of our absolute favorite flavors of Torani syrup. You can make up all kinds of flavor combo with these syrups. There are so many choices. I just recently started to venture into Sugar Free products... this brand has seriously got to be some of the best Sugar Free Strawberry Syrup I have found! Makes my teas taste wonderful! The sugar free strawberry syrup is delicious and very fresh in the taste. A great syrup for making a warm strawberry topping for cakes and pastries. I really like this flavor of Sugar free Torani. I mix it in my lemonade to make strawberry lemonade. It is so yummy! It would be good as a snocone as well. I love that torani has so many sugar free options !!! I absolutely love that they make strawberry flavored syrup that is sugar free and taste awesome.!! Highly recommend. We get requests quite often for sugar free coffee flavorings and the Torani sugar free strawberry flavoring is a good option. Our customers are happy with them. This sugar free strawberry syrup is a great option for Italian sodas when the customer wants one will less sugar. The flavor of this syrup to the regular strawberry syrup is so close you can hardly tell a difference. The Torani sugar free strawberry flavoring is a great no sugar alternative for flavoring my unsweet tea. It tastes wonderful and has a great flavor. I like to pour a small bit into each smoothie cup and customers adore it! They say it takes like you just got a strawberry right off the farm!!! Do this with lemon in sprite or tea and you'll be obsessed! This flavor isn't quite as strong as the others is why I'm taking off a star but I'd still order again just have to use extra! Having fruit flavors in addition to our coffee flavors adds another level of excitement for our students. We use them as additions to our smoothies and our frappe's in our coffee / beverage shop. We also top desserts with them as well. My family Loves this syrup! It's one of our most popular ones. Such a great true taste that sweetens any type of drink. Whether hot or cold! This is a must have for my pantry. Great for Italian sodas and desserts. Drissle on ice-cream, cakes and my favorite, used to make homeade jello. Can't beat the price highly recommend. I love to use fresh fruit. Sometimes it just isn't enough though. In my Mixed Berry Smoothie I have found this to be the case. I want to taste all of the distinct flavors as I enjoy my smoothie. All of my berries are still added, but I use just a cap full of Torani Sugar Free Strawberry, Torani Sugar Free Raspberry, and Torani Sugar Free Blueberry Syrups to enhance the natural fruit flavor. My Mixed Berry Smoothie is a breakfast favorite! Torani brand syrups are a great value. The diet flavors are especially are favorites. This Strawberry flavor is one we'll be re-ordering over and over -- very refreshing summer cooler when splashed in with club soda and a strawberry, if you have one. Great taste to flavor drinks! I've ordered 7 different flavors from Webstaurant, and it comes in a nice package that it was not damaged. This is the best price you will find. We use this in both coffee beverages and fruit beverages and it works great! The flavor is very strong and is great quality, because of that it only takes a little and help keeps are margins healthy. This product can be used in water, shaved ice or as a syrup for pancakes and waffles. Sugar free and flavor is why I recommend this product to all. I love Torani's strawberry sugar free syrup for its many uses..such as for desserts, flavored water, snow-cones or homemade slushies. I highly recommend to all! Love this flavored syrup! I would purchase this again! I love to add this to lemonade. It make a great summertime drink! My family can't get enough of it. 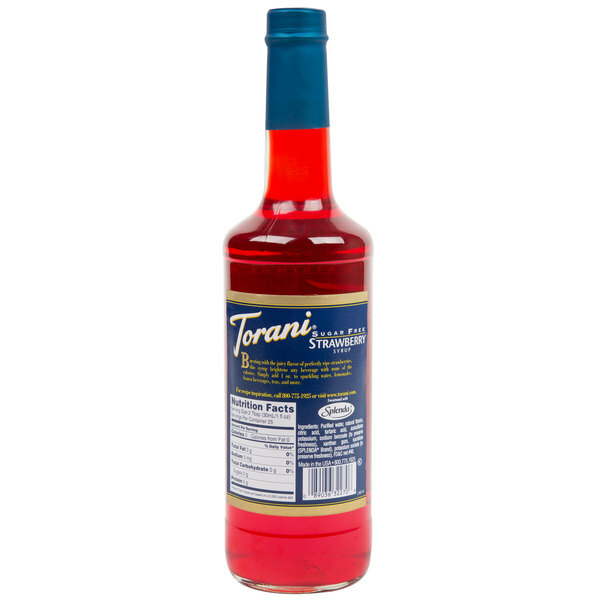 This Torani 750mL Sugar Free Strawberry syrup is one of the best we have worked with. It has plenty of flavor.makes a great addition to our shakes.